When it comes to accenting your personal space, personality speaks volumes. Whether your home or office is a vibrant blend of light and bright furnishings or an eclectic mix bold and dramatic tones, the Monarch Globe makes the perfect accent to your space. Add a splash of refreshing monochrome to a colorful palette or reinforce the mood among a darker color scheme. Decorative globes are a great way to add that perfect touch of elegance and sophistication to any room or space. The Monarch Globe by Replogle is a gorgeous 12" diameter globe which features sleek, slate grey bodies of water and silver landmasses. The monochrome color scheme gives this decorative tabletop globe the perfect blend of elegance and sophistication to subtly accent your room or office. Mounted on a full swing metal meridian atop a beautifully veined marble base, one can easily view every aspect of the globe without ever needing to pick it up. Offset a boldly colored space with this modern piece of decor, or add to a contemporary touch to a room designed with minimalistic style with nominal color, such as a room adorning primarily black and white tones. Why Use the Monarch Globe to Decorate your Home or Office? 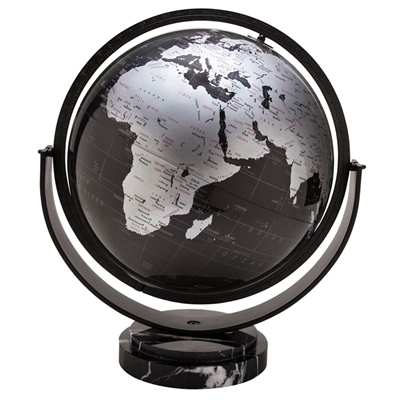 Many may not first consider a tabletop globe as a decorative piece, but they make for a truly unique and bold statement for those who seek to enhance the appearance of a particular space. Not only are decorative globes functional, they are also a timeless representation of knowledge and intrigue. A carefully placed decorative globe can complete the symmetrical balance of a room when used as a regal centerpiece atop a coffee table or wide mantle. Globes also embody an air of worldly eloquence rarely captured by other centerpieces or decorative accents. The Monarch Globe in particular, is uniquely colored, lending an extra element of exclusivity to your space. Rooms such as studies, home offices, dens, living rooms, and guest rooms are excellent places to place a globe for the ultimate complimentary touch. New trends on the horizon include more attention to contemporary acrylic accents, radiant copper flourishes and rustic hardwood flooring. With more attention being given to the beautifully fashionable hues such as silver, gold, and copper, the gorgeous tones of the Monarch Globe will make the perfect accent to your space. Between these pleasing and versatile tones, it is easy to add that perfect dose of glamour to your room by placing your globe on your tabletop or shelf. With marble making a bold comeback, the beautifully veined marble base of the Monarch Globe, is sure to please the eye. Few accents say elite as much as marble accents and this globe effortlessly embodies the look of choice style, while keeping up with the times. Lastly, crisper and brighter color schemes are growing in popularity, and the minimalistic tones of this globe are absolutely fitting for a room done in clear tones. Add the right element of sensation to your space with the Monarch Globe.